Looking for vacation rentals with stunning sunset views over the Gulf and Bay? The Deluxe Vacation Rentals at Resort Harbour Properties were made for you! 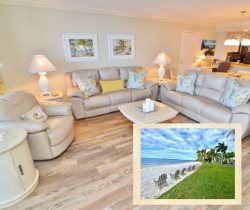 These Sanibel Harbour gulf coast beach rentals have been upgraded in recent years and offer a cohesive design theme throughout the units in order to complement the incredible views outside your balcony. Click View This Rental for details on the property of your choice. Or, for an upgraded accommodation, check out our luxury vacation rentals in Sanibel Harbour today.